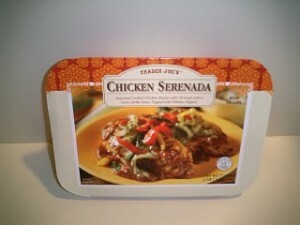 If you have a Trader Joe’s near you and are looking for an easy dinner option, I highly suggest their Chicken Serenada. I made it for dinner yesterday and it was really EASY and very very yummy! Serve it with some rice– in fact it takes about the same time to cook as rice. Talk about convenient! This entry was posted in Food on March 29, 2010 by Donna. the Chicken Serenada is at my local, friendly, convenient Aldi.